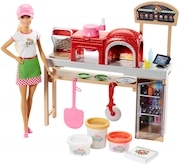 ​Young chefs can cook up playtime fun with Barbie® doll and the Ultimate Kitchen playset! Lights, sounds, colored dough, food molds and more than 20 pieces total provide all of the ingredients for delicious storytelling. 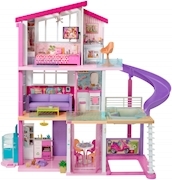 The bright kitchen has a cool design with multiple play spaces and realistic working features. There's an oven with a timer that dings -- use it to bake the pie that rises in the dough mold. On the stovetop, a red light mimics heat and boiling sounds are a life-like touch. The center counter holds a fry press -- fill with dough, then close and press the top to make fries and hear them sizzle -- and a sandwich maker that can be filled with dough and pressed to create sandwich layers. Assemble to make a sandwich that looks good enough to eat. A third section of the counter features a mini-fridge with working door below and a veggie mold on top; fill with dough, close the lid, press, open and remove healthy-looking mushrooms, tomato slices, a broccoli stalk and carrot. Five dough colors -- orange, yellow, white, green and beige -- let gourmets' imaginations create fabulous dishes. Additional accessories, like two place settings, a spatula, serving spoon, pair of tongs, knife, frying pan, pot and bowl -- some with handles a doll can hold -- encourage role-play and kitchen exploration. Barbie® doll is wearing her cute polka-dot apron, a blue dress and white shoes. Young chefs will have so much fun preparing all kinds of meals, from dinners for two to party menus for friends and family. 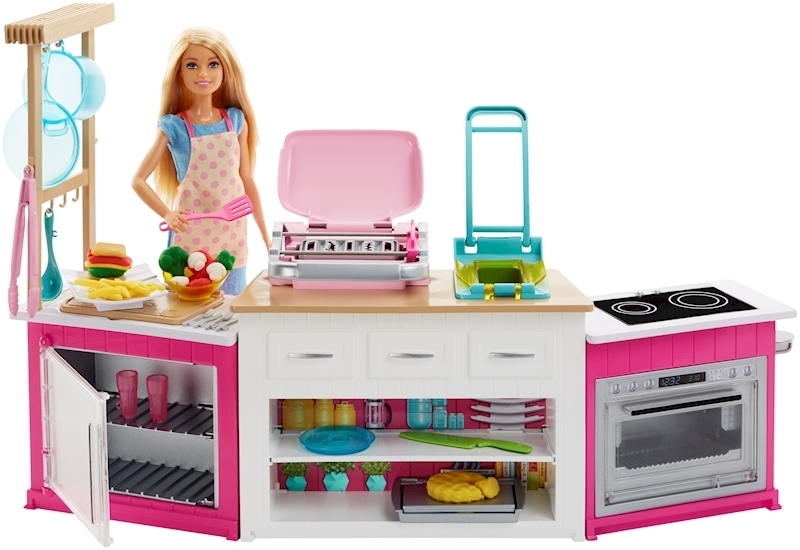 Collect other Barbie® dolls and playsets in the cooking and baking line to perfect a recipe for fun! Includes Barbie® doll wearing fashions and accessories; the kitchen playset with lights, sounds, veggie mold, sandwich maker and fry press; plus a pie mold, two place settings, cookware, utensils and five dough colors. Doll cannot stand alone. Colors and decorations may vary.